This past weekend, I ran the PR Race Series Lucky Leprechaun 5k at Reston Town Center. This is a really great race for those of you who haven’t done a 5k before. It’s mostly flat, it’s well marked, and it’s mostly flat. I’m sorry, did I repeat myself? My bad. I just hate hills. Because my middle son had a hockey tournament in Ashbury the same day as the race, my sweet hubby drove up with me so we’d only have one car instead of two. He was massively bummed that we couldn’t stay for the after-party, which was, of course, at a bar. 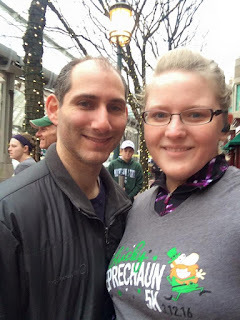 It was a St. Patrick’s Day race, after all! I also got this new matching purple outfit from my son, which I tossed my really nice race shirt over. You can’t see from the picture, but it’s a “technical” shirt, so the fabric feels amazing. What’s wrong with all this fab new racing stuff is that it’s not green. And man, did people get into this race and the St. Patrick’s Day Spirit!! Next year I’ll definitely go a little harder in the costume department. I am seriously lacking in tutu ownership, so I’m going to have to watch for a sale. Side Note: Does anyone know where you buy adult sized tutus? Or maybe you make your own? IDK. Also, the kilts. For the win. There were a good couple hundred (maybe even a thousand?) of my closest running buddies at the race, so plan to be with a crowd. Again, the beginning is very flat, the only real “hill” and I use the term loosely, is a slow grade the last mile. It’s nothing you can’t handle, even if you don’t like hills, evidence: I finished in less time than my last 5K! Whoohoo! There was also a short kids run at 9:30, which we didn’t get to do because, again, hockey. However, I did get a giant green bagel that I could only eat half of, and it sounded like the after party was going to be a good time. I did not require the services of a porta potty, but there were plenty of them for those who did. The only downside to this race was for drivers who didn’t notice the ample signage that the roads out of the town center were going to be closed for the race. There was one woman who had gotten out of her car to scream at a police officer directing traffic (who was not in the least concerned) because the race was blocking her getting out to wherever she was going. The irony was that she was wearing a shirt that said “Run”, so she’s probably blocked some traffic herself. And honestly, exiting wasn’t hard. There was plenty of free garage parking when we arrived, and since they require you to keep a 20 minute mile pace (which you can walk), by the time I got my snack and we got back to the car, we were able to exit quite easily and get to our first hockey game of the day on time. 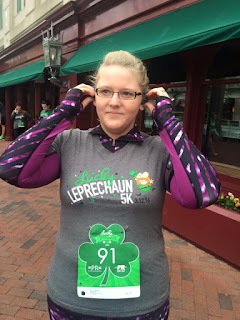 I’d definitely run the Lucky Leprechaun again next year, and next time, I’ll definitely wear more green! Thanks for having me PR Races! !